Once, all life in the universe knew the Flower of Life as the creation pattern—the geometrical design leading us into and out of physical existence. Then from a very high state of consciousness, we fell into darkness and forgot who we were. For thousands of years, the secret was held in ancient artifacts and carvings around the world and encoded in the cells of all life. Now we are rising up from that sleep, shaking old, stale beliefs from our minds and glimpsing the golden light of this new dawn streaming through the windows of perception. This book is one of those windows. 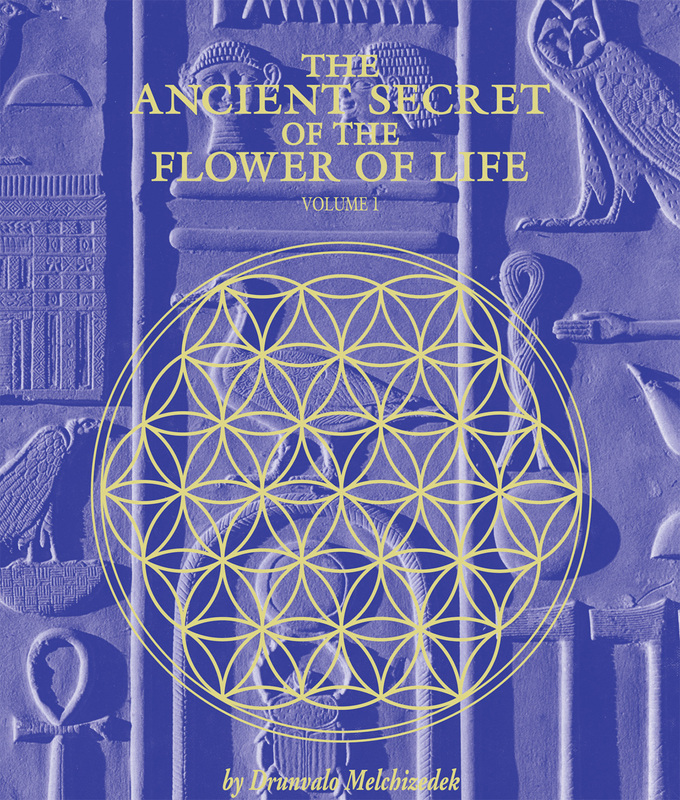 Here, Drunvalo Melchizedek presents in text and graphics the first half of the Flower of Life workshop, illuminating the mysteries of how we came to be, why the world is the way it is, and the subtle energies that allow awareness to blossom into its true beauty. Explore the miracle of our existence by meandering through the wonderland of geometry, science, ancient history, and new discovery seen through the widened vision of Drunvalo and the Flower of Life, Volume II will explore in great detail the Mer-Ka-Ba, the 55-foot-diameter energy field of the human lightbody. This knowledge leads to ascension and the next dimensional world. Submitted by otto peace: sirius on Wed, 01/30/2008 - 10:24. Submitted by Jennifer: Orlando, Florida on Mon, 11/27/2006 - 10:22. I just now (last night) finally did the part where you connect with your Higher Self and do the Mer-Ka-Ba. I had no trouble at all starting everything off properly. These two books together (I and II) are absolutely life-changing and I recommend them highly! Submitted by minnayu: China on Sun, 04/20/2003 - 10:21. I am a Chinese. I found this book during the vist to my Child in Toronto last May. I could not wait to read it through. This is one of the best books I ever read with full of wisdom to link the current science phenomina with the background divine energy. I started Merkaba Meditation though I could not find any workshop in my area. I know this is the tool I have been long looking for as compared with many other healing tools I ever tried. I am looking forward to more products from Mr. Druvalo Melchizedek. I wish one day I will meet Druvalo Meschizedek,if it is also God's wish. Submitted by Brandon Smith on Wed, 06/13/2001 - 10:19. Five stars. I just bought this book a couple days ago at Borders, I just finished it and I'm blown away. If you want to lift the veil, you need to read this series. I can't explain how this information completely fits. It changes your brain. What I've always thought is true and my life feels right. If you feel drawn to this man, then read his work! Submitted by Norma Hughes on Mon, 11/05/2001 - 10:16. Drunvalo Melchizedek tried to bring a useful focus to a veritable “avalanche of knowledge” and has done a very good job of it. Submitted by Kenneth James Michael MacLean on Wed, 12/03/2008 - 10:08. This book is not for those who think "in the box." It IS for those desiring to expand their mental horizons. In this book the author talks about the 5 levels of human consciousness, the MerKaBa(the energy field which surrounds all living things), and explains with geometric diagrams, a very interesting interpretation of the Biblical story of Genesis. And there is a lot more in this book to blow your mind. Submitted by David Castleman: Yorba Linda, California on Fri, 09/26/2003 - 14:49. These are amazing, stimulating, and exciting books (Vol. I and II) that eloquently explain Sacred Geometry in magnificient detail and how it relates to all life and everything in existence in this universe. The author effectively projects pure love to the reader. Further, he emphasizes that God is Love and there is only ONE Reality. Everything is Light and nothing else. The only real thing that holds us back is Fear itself. I appreciate that he admits when he isn't sure about something and relates his personal theories. This makes the facts more believable and undenialable. The geometric mathematics are flawless and demonstrates dramatically that this creation is perfect and everthing God does, will do, and has done is perfect in infinite detail. He shows that Life is Wonderful, Joyous, and Exciting and makes one truly and deeply thankful to God for everything in this and who knows how many universes. Submitted by Chris Jordan on Wed, 01/22/2003 - 14:45. Drunvalo has brought an interesting piece of work to the forefront of human existance. Intense explanations on life, religion and consciousness amidst of blurry of scientific proof leave the reader interested and at times stupified. Submitted by Jennifer: Orlando, Florida on Sun, 11/26/2006 - 14:15. This book is great and helped ot explain a lot to me, why I always felt certain things. If there is a downfall, it's that the book is written to the left-brained world which makes it difficult for me (I am almost completely right-brain dominant) but despite the difficulty and having to struggle, I felt it to be very much worth the work and I feel it helped the inbalance just a little, making it easier for me to move about through the 9-5 world. Submitted by Sandag: Mongolia on Sat, 11/01/2008 - 13:18. A little less than 13.000 years ago, something very dramatic happened in the history of our planet that we're going to explore in great deial, because what happened in the past is now affecting very aspect of our life today. Submitted by D. Dockray on Fri, 11/21/2008 - 11:35. “ Invaluable information you may not find elsewhere. As an engineer and a student of Spirit, I believe Drunvalo and Thoth are right on the money. If you have not extensively studied related spiritual subjects that he often touches on briefly, you will be overloaded and dismiss the information as crazy, as I see many have. Drunvalo is not crazy. It is a fact that when one reaches a certain spiritual level, they will begin to communicate with entities from another dimension. Thoth, an immortal entity, downloads to us through Drunvalo. I believe the information is of the light, selfless and pure. These are the secrets of life. Believe it or not, "it is only light".